Dish Network Jan. 8 announced it is incorporating the Google Assistant software into its Hopper family of receivers. In the coming months, subscribers will be able to use the Dish voice remote to ask the software to control smart home devices, provide weather and news updates, display photos and more. This new integration builds on the Dish voice remote’s existing ability to control the TV experience, including navigation, search and content selection. “Our customers love the convenience of voice control, so we’re expanding functionality to make it even more powerful,” Niraj Desai, VP of product management, said in a statement. With the software, subs will be able to use the voice remote to ask questions and see answers on the screen like the weather forecast or games scores. Users will also be able to control smart home devices, such as dimming the lights or adjusting the thermostat, and relive favorite memories by pulling up Google Photos on the TV screen – all with their voice. Customers with a voice remote and broadband-connected Hopper (all generations), Joey (all models) or Wally will have access to the Google Assistant. New subs receive the voice remote with all Hopper family receivers at no extra cost; current customers without a voice remote can upgrade for $20. Panasonic Jan. 7 announced the launch of the GZ2000, featuring a Professional Edition 4K OLED panel tuned in Hollywood that incorporates custom hardware improvements by Panasonic. “Optimized by a leading Hollywood colorist, the new panel highlights unparalleled color accuracy and significantly better than average brightness levels,” according to a Panasonic press release. Panasonic announced it is the world’s first TV to support the high dynamic range formats HDR10+ and Dolby Vision, as well as the HLG Photo format, the new still image format which brings still photography into the HDR world. Supporting both Google Assistant and Amazon Alexa, the GZ2000 can integrate with a smart home setup. 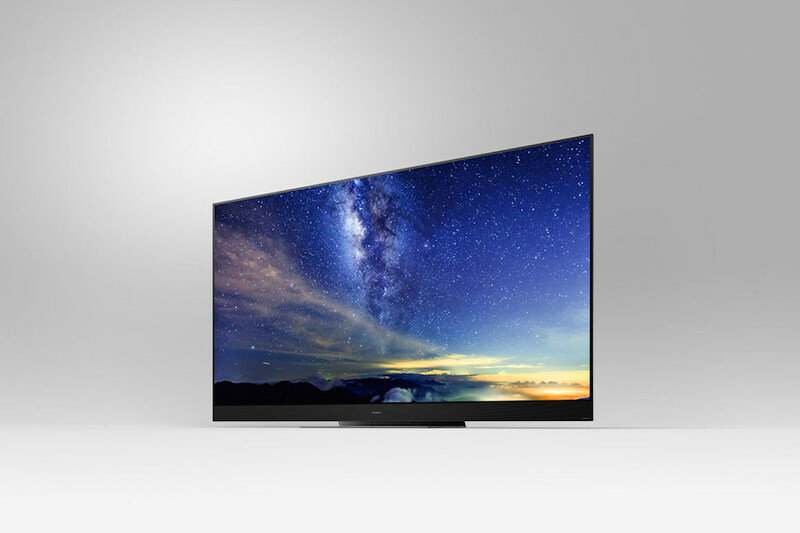 Available in 65-inch and 55-inch screen sizes, the GZ2000 OLED features the color-tuning skills of Stefan Sonnenfeld. 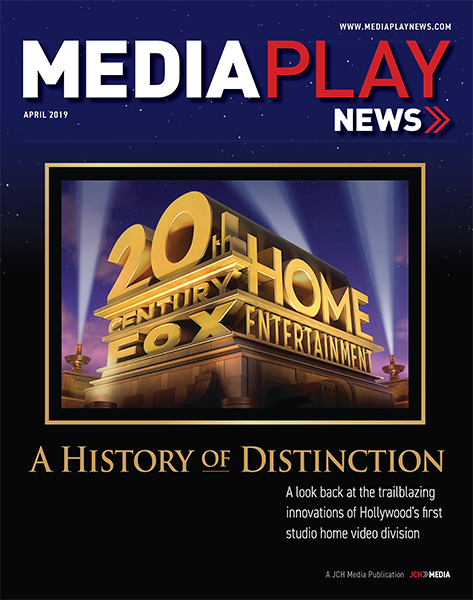 Sonnenfeld, founder and CEO of Company 3, is “a trusted collaborator of some of the world’s best filmmakers,” Panasonic announced, applying his skills as a colorist to such features as A Star Is Born, Wonder Woman, Man of Steel, Beauty and the Beast, Star Wars: The Force Awakens, Jurassic World and 300. He uses Panasonic OLED screens as large-format client reference monitors in his daily workflow, according to the release. The TV’s average brightness level has been boosted significantly and contrast handling improved, resulting in increased dynamic range, the release stated. “HDR content now looks even more impactful, with the GZ2000 effortlessly able to reproduce tricky scenes of variable brightness and contrast — often found in live sports broadcasts and in action movies,” the release stated. “Because of this level of customization, combined with the exceptional color-optimizing skills of Sonnenfeld, Panasonic has created some of the most accurate, cinematic images ever seen on a TV. The GZ2000 is also compatible with Hybrid Log-Gamma (HLG), an HDR format expected to be widely adopted by TV broadcasters, the release stated. The GZ2000 also features Panasonic’s new My Home Screen 4.0, which allows viewers to tailor the TV user interface to their own preferences, the release stated. The layout of the home screen can be reconfigured to allow customized layouts. Access to VOD and broadcast content is also easier thanks to a redesigned GUI that includes icons for decks that provide shortcuts to live TV, connected devices and apps such as Netflix, Amazon and YouTube. Viewers can even add frequently watched TV stations to the home screen. LG Electronics literally rolled out what SVP of marketing David Vanderwaal called the “ultimate future TV”; it’s a TV that rolls out of the sound bar box below. 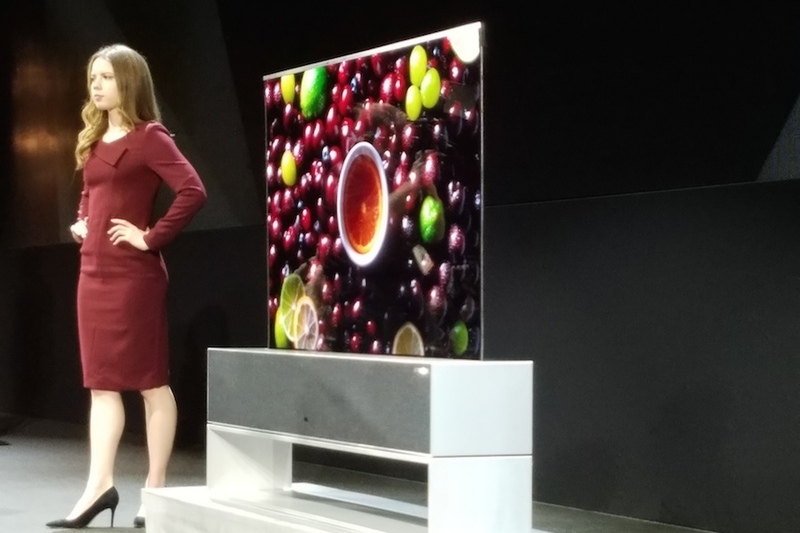 To oohs and aahs from the crowd, the company unveiled its LG Signature OLED TV R, which “magically rolls up,” senior director of product marketing Tim Alessi added during a Jan. 7 press conference at the CES show in Las Vegas. The TV “brings freedom of design to a space,” Vanderwaal noted. The TV can roll up only partway in the box, which includes a Dolby Atmos soundbar, to become a control console to check the weather and perform other functions. In what is called the “zero view,” the TV is hidden completely and can be used to play music. The company also announced LG’s first 8K OLED TV, device compatibility with Amazon’s Alexa (in addition to Google’s Assistant announced last year) and the addition of Apple AirPlay to the 2019 TVs. In partnership with Qualcomm, LG phones will include the Snapdragon 5G mobile platform. A crossover promotion between 20th Century Fox and Google revisits the 1990 holiday comedy Home Alone with a modern twist. 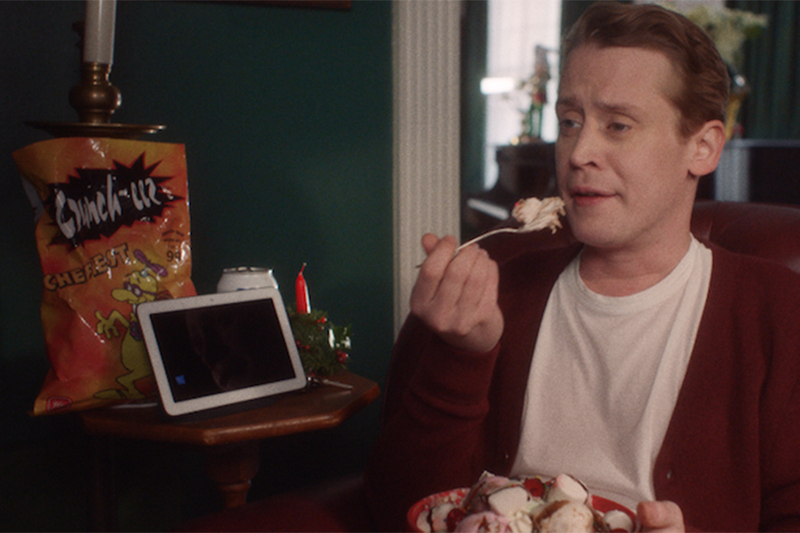 A new ad features Macaulay Culkin reprising his role as a now 38-year-old Kevin McCallister re-enacting scenes from the film with the aid of Google Assistant-enabled devices. The adult McCallister uses his voice-activated Internet devices to pay for a pizza delivery, order new aftershave and control the elaborate traps he sets up to scare away the Wet Bandits. “How much do I owe you?” or “It’s me Snakes. I got the stuff,” to recreate a back-and-forth dialogue from the movie Kevin watches, Angels With Filthy Souls. “The Wet Bandits are here” to hear what Kevin would do. “I’m the man of the house” to hear what happens when Kevin puts aftershave on his face. Fox reported that Home Alone searches on Google trend during the holidays, spiking 1900% in a month last year. Home Alone is available on Blu-ray and DVD, as well for digital purchase at Google Play and other online retailers. 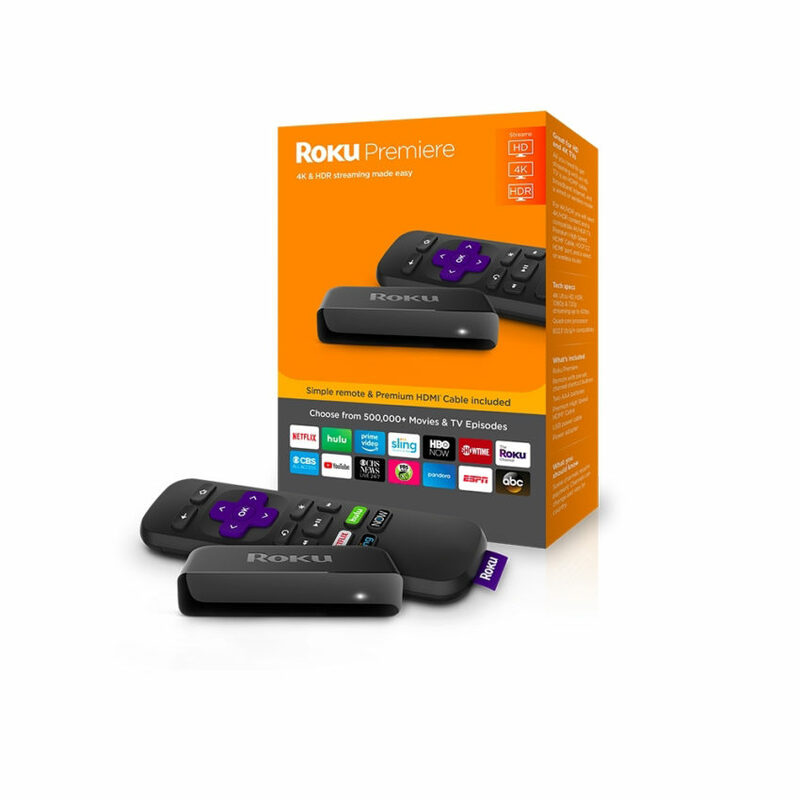 Roku Sept. 24 announced it is expanding its streaming player lineup with the addition of two new devices – the new Roku Premiere and the new Roku Premiere+. The Roku Premiere ($39.99) and Roku Premiere+ ($49.99) offer streaming video in HD, 4K Ultra HD or 4K HDR. The company also announced updates to its ultimate streaming player, the Roku Ultra, which now features premium JBL headphones and priced at $99.99. “Tens of millions of 4K TVs will be sold this year; we’re seeing more content, even live sports, produced and streamed in 4K and HDR as each week goes by,” Lloyd Klarke, director of product management at Roku, said in a statement. Roku Premiere features immersive picture quality in HD, 4K Ultra HD and 4K HDR, quad-core processor and low-profile form factor. It includes an HDMI cable, remote control with channel shortcut buttons, Dolby and DTS Digital Surround pass through over HDMI. Premiere+ includes everything the Premiere offers plus a voice-activated remote with TV power & volume buttons. Roku Ultra features the lost remote finder that can be set to play popular tones, including ESPN “SportsCenter” or HBO’s “Game of Thrones” theme song beginning in November. The Roku Premiere is available for pre-order at Roku.com and, along with the Roku Ultra, will be available at all major retailers beginning in early October. The Roku Premiere+ will be available exclusively at Walmart and Walmart.com in early October. Separately, Roku announced a software update for Roku TVs that enables new features for compatibility with upcoming Roku TV Wireless Speakers; and Roku OS 9, a new software release with a variety of enhancements to give users new ways to search and control their entertainment experience. Roku will soon enable the ability to use Google Assistant devices to control Roku streaming devices. In addition, premium music services Spotify and Pandora Premium support are coming to Roku devices. Dish July 9 debuted its integration with the Google Assistant for a hands-free TV entertainment experience. Dish customers with a Hopper, Hopper Duo, Joey or Wally can control their TV using their voice when paired with an Assistant device, such as Google Home, Android phones or iPhones. 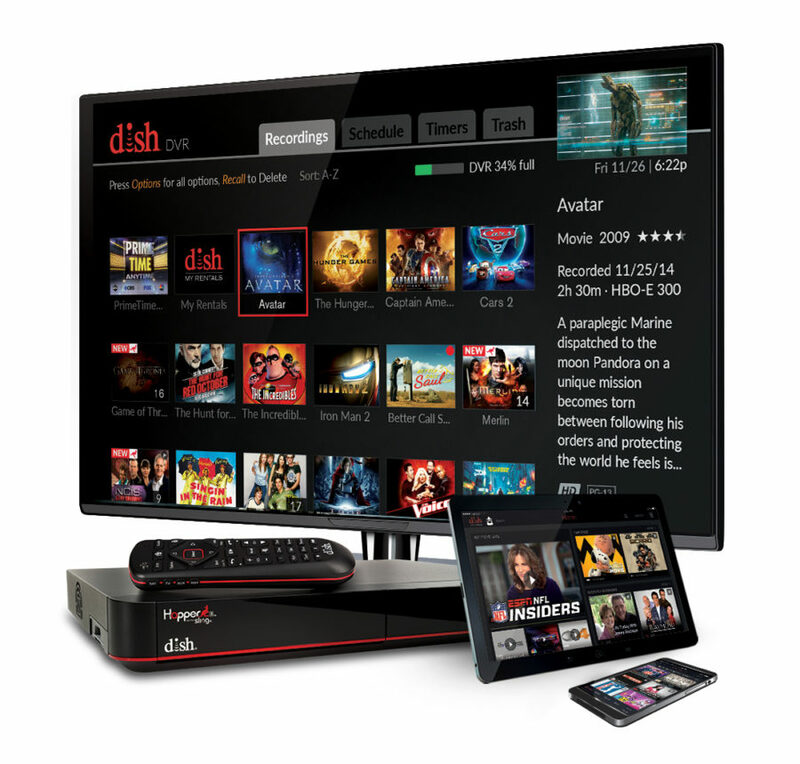 Dish is the first pay-TV provider to offer direct compatibility with the Assistant. 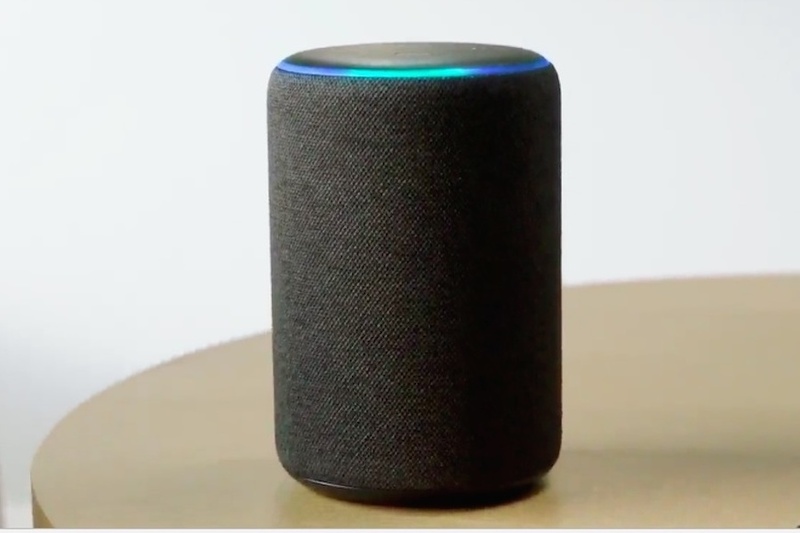 Customers can ask the Assistant to set recordings, adjust volume and launch apps such as Game Finder, Netflix and Pandora. Customers can also use the Assistant to navigate, play, pause, fast-forward, rewind and search content based on channel, title, actor or genre. 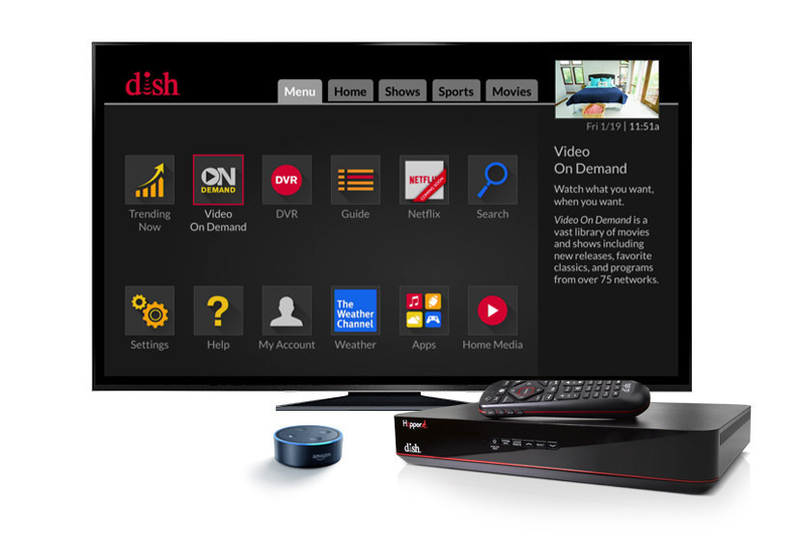 When using search functionality, the results displayed include Dish’s live, recorded and on-demand titles, as well as Netflix’s selection of TV shows and movies. Spanish-language support will be coming soon, according to Dish. LG Electronics USA May 8 announced the launch of the Google Assistant on its 2018 AI TV line-up. This includes both LG OLED TVs and LG Super UHD TVs with ThinQ AI, which will deliver AI features operated directly through the TV’s remote control with no additional hardware required, the company reported. 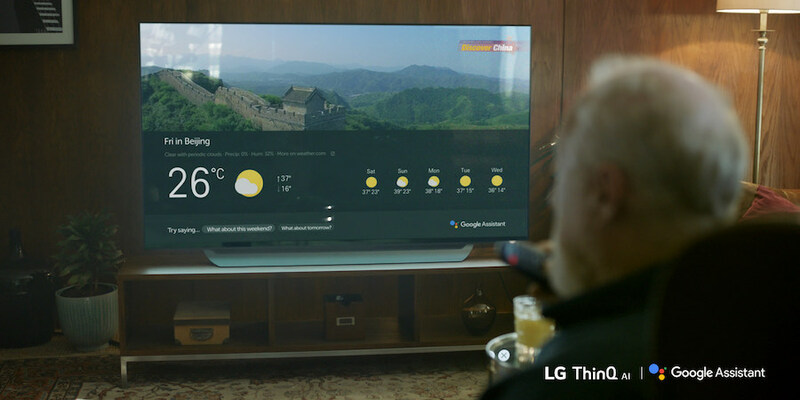 The Google Assistant combines with LG’s webOS-based ThinQ AI to enable 2018 LG TVs to deliver “an intuitive AI experience that uses natural language commands to control TV functions, seamlessly discover and play content and control TV settings,” according to LG. “With the Google Assistant, you can ask it to manage daily tasks, access information, control compatible smart home devices including lighting, appliances and much more,” an LG press release reads. LG and Google are collaborating to develop a range of features and are working to expand consumer accessibility in multiple languages, the company announced. LG’s 2018 AI TVs can perform hundreds of voice commands utilizing the company’s own open smart platform as well as the built in Google Assistant. With LG’s ThinQ, users can immediately connect to external gaming consoles and soundbars, switch picture mode or turn the TV off at set times. LG 2018 AI TVs can retrieve information or switch to a channel that offers the content requested by the viewer, according to the release. “Switch to Discovery channel” instantly connects users to information about future travel destinations. Users can learn more about their desired films by saying a character’s or actor’s name. They can tell the TV to “search for the soundtrack of this movie” or “turn off the TV when this program is over” without needing to schedule a time. With the Google Assistant built in, LG’s 2018 AI TVs allows users to manage different tasks, find answers or control smart home devices, the LG release noted. Users can press and hold the mic button to ask for information such as the weather forecast, nearby local businesses, or check the score of a game without disturbing the viewing experience. Users can also display Google Photos and access devices such as robotic vacuum cleaners, thermostats, air purifiers and smart lighting. LG’s 2018 AI TVs also work with existing Google Assistant devices such as Google Home and other smart speakers with the Assistant built in, allowing users to send voice commands directly from a separate Assistant device to their LG TV. TV owners can speak to other Assistant devices to control TV functions such as volume, play, pause, start, stop, fast forward, channel selection and content search. LG’s 2018 AI-enabled TVs will work with other Google Assistant devices in the United States, the United Kingdom, Canada and Australia, with further expansion to be announced later this year.